Caspase-3 belongs to a family of evolutionally conserved cysteine proteases that play a key role in regulating programmed cell death, or apoptosis, a normal process required for maintenance of tissue homeostasis and the regulation of physiological functions1. The two main apoptosis activation pathways are the extrinsic and the intrinsic pathways. The extrinsic pathway is activated by the binding of ligands (including TNFα, FasL, and TRAIL) to cell-surface receptors. The intrinsic, or mitochondrial, pathway is typically activated in response to DNA or cellular damage. The convergence of the extrinsic and intrinsic pathways occurs at the proteolytic activation of caspase-34. Once caspase-3 is activated, a series of irreversible events are set in motion that lead to the death of the cell, including activation of the CAD endonuclease that degrades DNA within the nucleus and initiates chromatin condensation5. Abnormal apoptosis function has been linked to many diseases. Increasing evidence suggests involvement of caspase-3 in Alzheimer’s Disease (AD) via cleavage of amyloid prescursor protein (APP) and tau and the formation of beta-amyloid (Aβ) and neurofibrillary tangles (NFTs), making caspase-3 an interesting therapeutic target3. Recent studies have also shown a role for caspase-3 in growth stimulation via PGE2. High amounts of caspase-3 have been linked to an increased rate of cancer recurrence and death in patients undergoing radiation treatment through the stimulation of growth of surviving cancer cells, making caspase-3 a key prognostic marker and therapeutic target in cancer therapy6. Detection of active caspase-3 is an alternative method to Annexin V-FITC / PI, which involves binding to phosphatidylserine (PS) on the surface of apoptotic cells. The translocation of PS to the surface of the cell membrane occurs downstream in the apoptotic process following activation of caspase-3, so both methods identify cells irrevocably committed to death through either the extrinsic or intrinsic apoptosis pathways. Because Annexin V-FITC binds PS on both apoptotic and necrotic cells, propidium iodide (PI) is used to differentiate necrotic cells by staining cells with compromised membranes. An advantage of active caspase-3 measurement is the specificity for apoptotic cells2. 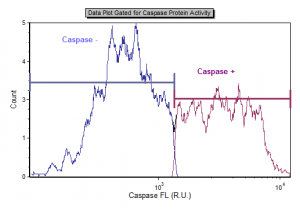 Caspase-3 activity in living cells can be easily measured using image cytometry. When detecting caspase-3, a specific FITC-conjugated caspase-3 inhibitor, DEVD-FMK, is utilized. DEVD-FMK is cell-permeable and binds irreversibly to active caspase-3 within the apoptotic cell. DEVD-FMK bound to the fluorescent marker FITC allows for the detection of cells undergoing apoptosis via Caspase-3 activation using the Vision CBA Image Cytometry System. Cells positive for active Caspase-3 fluoresce in the green channel. Cells negative for active Caspase-3 do not fluoresce. Caspase-3 activity is expressed as a cell concentration and a population percentage. The CaspGLOW™Fluorescein Active Caspase-3 Staining Kit, available through Nexcelom, includes detailed instructions for sample preparation, staining, imaging, and data analysis using the Cellometer Vision CBA Image Cytometry System. 3) Rohn, T.T., et al. (2009). Caspases as Therapeutic Targets in Alzheimer’s Disease: Is It Time to “Cut” to the Chase? Int. J. Clin. Exp. Pathol., 2: 108-118. 4) Porter AG. Flipping the safety catch of procaspase-3. Nature Chemical Biology, Vol. 2 November 10, 2006. 5) Elmore, S. (2007). Apoptosis: A Review of Programmed Cell Death. Toxicol. Pathol., 35: 495. 6) Huang, Q., et al. (2011). Caspase 3-Mediated Stimulation of Tumor Cell Repopulation During Cancer Radiotherapy. Nature Medicine. 17: 860-866. Do you rely on a Flow Cytometer? Want to break free?